Our courts and clubhouse are not open to members of the public, however, members may bring guests to play during appropriate court hours. Guests may visit the club up to five times per year. A fee of $5, payable by the member or guest, must be placed in the provided envelopes and deposited in the Guest Fee lock box in the clubhouse. Please write both the guest and host names on the envelope. The member is responsible for looking after his or her guest while the guest is at the club, including ensuring that the ‘Guest’ tag follows the member’s tag on the tag board if playing in rotation so that the guest is not required to make up a court. Guests have the same playing privileges and obligations at members and must respect the club Code of Conduct and dress code. 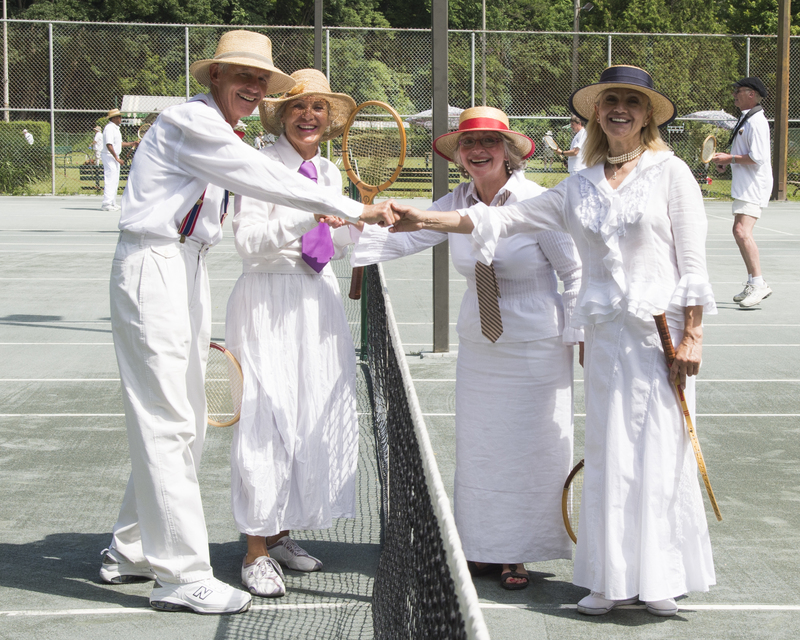 All tennis shirts, shorts, skirts and dresses must be all-white with up to a maximum 10% colour trim (including hats/visors). Non-tennis wear (such as cut-offs, jogging shorts, street clothes, etc. ), even if white, is not considered appropriate attire. Shirts with large writing, advertising or pictures are not acceptable, even if predominantly white. Non-white tennis warm-up suits, sweaters and jackets are acceptable although it is preferable that it be white in colour if you plan to continue playing in your warm-up attire. 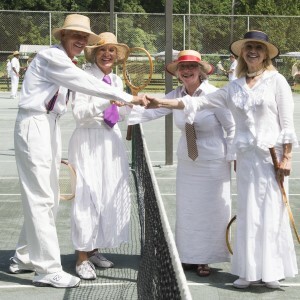 Tennis attire must be worn under warm-up suits and must be all-white. Non marking proper clay court tennis shoes must be worn to preserve the court surface. Those in violation of the dress code will be asked to change into appropriate white attire or leave the court. Member and guest understanding and cooperation is appreciated in helping to carry out the spirit and tradition of the dress code. 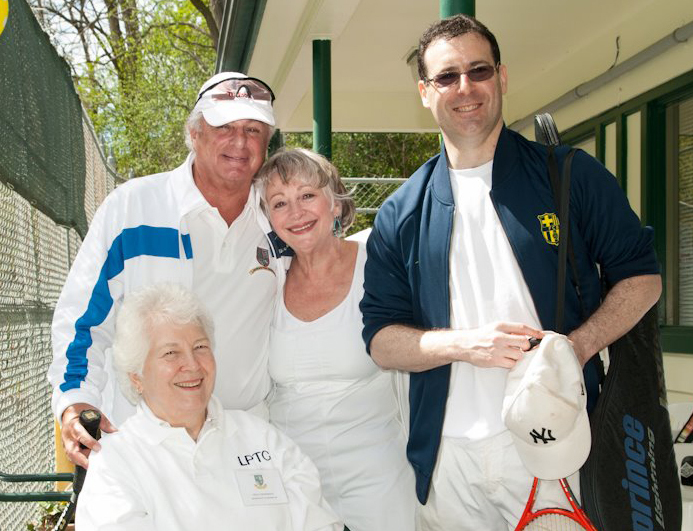 All members and their guests, including members from other clubs playing matches at LPTC, are expected to abide by LPTC Rules and demonstrate courtesy and proper court etiquette for the safety and enjoyment of all. Loud, abusive, or profane language and abuse of a racquet or a ball, are not permitted. Smoking is not allowed in the clubhouse, on the veranda area or patio or on the courts. Pets are not allowed inside the clubhouse, on the veranda area or patio or on the courts. No more than 3 balls are allowed on a court at a time, except when being used for clinics or by a Club tennis professional. To cross behind a court, wait for a stoppage in play on that court. To secure your ball from another court, wait for a stoppage in play on that court to retrieve or to request it. If in doubt about a line call on your court, play it as “in”. Other than first serve, if you see your ball is clearly out, call it out. Indicate an “out” ball with an index finger pointing up, and an “in” ball with a horizontal palm. An “out” or “let” call must be made immediately. If you call a ball out and then realize it was good, correct your call immediately. Enter playing area by the gate closest to your assigned court. When playing during evening hours, please be sure to turn off the courts lights when you leave. The clock outside the clubhouse governs court time. Harassment, bullying or discrimination of any type will not be tolerated and may lead to loss of court privileges, suspension, expulsion from the Club. Members must lock the clubhouse door, court gates and entrance gates if they are the last ones to leave the Club grounds. Please also ensure balls are put away, lights in the clubhouse and on court are turned off, the blinds are drawn and the maintenance shed is locked. Please respect the Club property and keep it clean and tidy. All members and their guests must abide by the Club’s Code of Conduct. Members are responsible for ensuring that their guests follow the Code of Conduct. In order to allow maximum enjoyment of court time, doubles will take precedence over singles on tag up courts. Specifically, if members are playing singles and other members arrive within the first 5 minutes of play time, those playing are required to double up. After 5 minutes into the court period, whether to invite members arriving to join play is at the discretion of those using the court. Any member using an untagged court must yield the court to members who are properly tagged for that court. One member cannot tag up on a court with a single tag for themselves. A member occupying a court on his/her own must give up that court for singles or doubles play. If no one comes to claim a court within 5 minutes of the start of the period, members on the court may move their tags and continue to play and members who are playing singles may continue to play singles. If a court becomes available up to 10 minutes before the hour, players who have tagged up for that court may start to play. Lessons may be held only on a reserved court with one of the Club professionals and a maximum of 4 participants. The court should be booked by the member using the online booking system. Lessons should be booked by contacting the member’s preferred Club professional directly (email addresses for Club professionals are in LEARN section). Lessons should be for one hour periods.